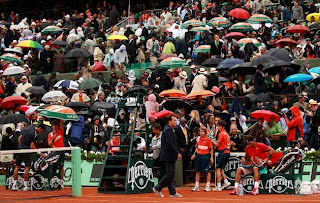 The rain didn't go away Sunday in Paris, causing two stoppages at the French Open final and postponing the finish of the men's final between Novak Djokovic and Rafael Nadal until 7 a.m. ET on Monday. Nadal, the six-time tournament champion, was leading the top-ranked Djokovic 6-4, 6-3, 2-6, 1-2 when play was postponed for a second time at 6:54 p.m. local time. An earlier stoppage in the second set lasted 34 minutes. A misty rain had fallen for much of the match and contributed to a heavy feel for both the clay and the tennis balls. The Spaniard won the first two sets and was up an early break in the third before Djokovic rattled off eight games. According to the ATP's Greg Sharko, it was the first time Nadal had ever lost eight consecutive games at the French Open. Given Nadal's dominance at Roland Garros -- he's 51-1 in his career -- the Djokovic comeback was nothing short of stunning. The wet ball may have had something to do with Nadal's struggles. 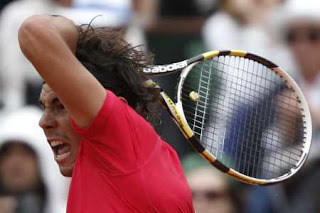 The wetter the ball, the harder it is to add the devastating topspin that makes Nadal so dangerous on clay courts. Whatever it was, Nadal was uncharacteristically testy at the start of the fourth set. He petulantly threw a wet ball in the direction of the chair umpire and repeatedly looked toward head referee Stefan Fransson during Djokovic's mini-run, asking why the players were still on the court, still playing. When Fransson finally decided to call a rain delay for the second time, Nadal showed his irritation. "It's always the same with you," he said while jabbing a finger at Fransson. "You never take one position." 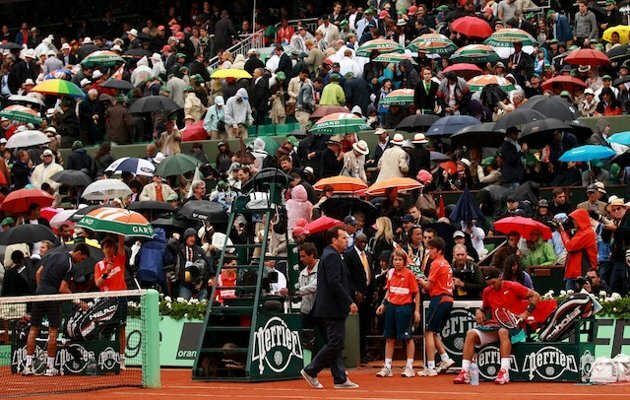 Rain was in the forecast for Sunday afternoon, but French Open officials declined to move up the 3 p.m. start time of the match. Had the final started two hours earlier, it's likely Nadal would have raised his record-setting seventh trophy at Roland Garros or Djokovic would be toasting his fourth-straight major. Now, the coronation of either of the world's top two players will have to wait until Monday afternoon in Paris, if we're lucky. There's a 70 percent chance of showers in the forecast. NBC Sports Network will broadcast the remainder of the match. Nadal has already demonstrated his dislike for electric blue / hot pink dyed clay . Now, if only the top players could come to a consensus to boycott venues with such asinine, visually-confusing coloring. It would be nice, too, if college teams in football and basketball would do the same.